The quoted price is for Look2Talk Complete. Look2Talk Reference Materials and the Look2Talk Binder are also available to purchase separately – details given below. Look2Talk is the award-winning guide for parents and professionals who need to make and use a communication book for children who communicate using their eyes alone. When speech can’t be understood, and using hands or fingers to point is difficult, eye-pointing to pictures, symbols or text can be a fast and effective way of communicating a wide range of messages. This guide introduces a step-by-step system that brings in symbols and pictures at a speed that suits both the child and the responder. It emphasises the importance of learning together in fun, relaxed activities where the child can take control. What vocabulary do I put in the book? How many pictures or symbols do I use on a page? Where and when do I start to use the book? How do I develop the book over time? A stable core vocabulary, available on each page of the communication binder, that develops through five stages. This core, ranging from just two symbols in Stage Two to 24 in Stage Five, is based on the development of children’s functional language as opposed to syntactical language. A fringe vocabulary designed to meet an individual’s interests, needs and varied environments. The importance of a communication partner who is shown, throughout the process, how to use and model the symbols during communication and to support and scaffold the learners’ own communication attempts. We know of no other resource that provides such specific and comprehensive guidance to help this small but important group of children who struggle to communicate. 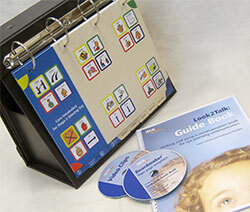 Look2Talk Complete contains a 60-page guide book alongside a custom-made communication easel binder (see below) complete with core and example vocabulary dividers. These materials are accompanied by a DVD of video clips and a CD containing templates for the topic pages. The binder and core vocabulary dividers are designed to form the basis for your own communication book. The templates on the CD can be also be downloaded free of charge from the menu on the right. There are Boardmaker templates for the core and topic pages, and additional Microsoft Word templates for the topic pages. Last updated in July 2009. We recognise that not everyone will need the binder, so we also offer Look2Talk without it. This publication is the result of the two-year Look2Talk Project run by the ACE Centre to support and learn from children who can only use their eyes to communicate. The authors are experienced practitioners who specialise in AAC for children with severe communication and physical difficulties.